It's very rare that I fall in love with a Netflix Original show and you can probably tell because the last time I wrote about one was when Stranger Things was massive. My boyfriend, on the other hand, is a sucker for a Netflix Original (I constantly say to him that he should do some guest posts for me!) and it's because of him that we started watching The OA. I'd seen a few people recommending it, so I was willing to watch, but after reading the blurby bit on Netflix, I just wasn't so sure. I expected aliens, but that's not what I got. Instead, I was given something so much more interesting and thought-provoking, and I was absolutely hooked. If you were a fan of Stranger Things, you may want to keep reading, as I think you'll love this show! 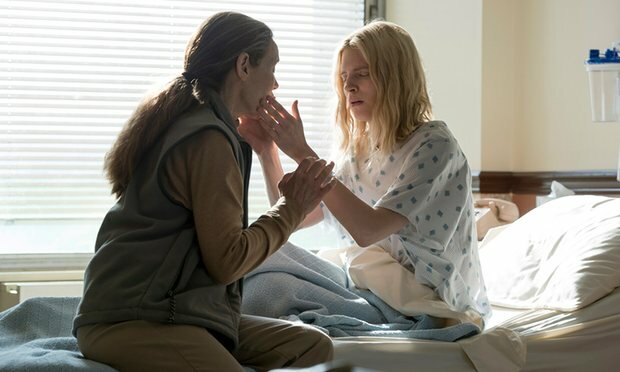 Without giving too much away, The OA is about Prairie Johnson, a girl who that had been previously missing for seven years. The show follows her as she recounts her story to five unlikely friends, explaining where she had been, how she regained her sight (uh, yeah, she was blind before she went missing!) and how they are going to help her with her mission. In amongst all of that, you get to see her and all of the other characters develop, which is lovely, and I definitely feel like I managed to establish a connection to all of them. It's so easy to get sucked into the story, making it just as easy to binge watch this programme within a week. It's a bit of a sci-fi meets thriller meets drama meets a sort of fantastical-supernatural style, so it's a mixed bag. As I mentioned in my Stranger Things post, I think Netflix have really stepped up their game when it comes to production value, and this is another of their programmes that shows it. The soundtrack to the whole thing was perfect and some of the shots were just beautiful. The director, Zal Batmanglij, did an amazing job at capturing moments and emotions in single shots, while keeping the colouration of the programme very dull, which is something that I imagine is difficult to do. As well as having a fab soundtrack, director and camerawork, the cast were incredible. Jason Isaacs (yup, Lucius Malfoy) plays his role so well and I found him so convincing, and I absolutely fell in love with Ian Alexander, a transgender Asian-American - it was refreshing to see a character that is rarely, if ever, portrayed in TV and film. And who couldn't love BBA?! Of course, I loved Brit Marling too. I thought her performance as a blind woman was incredible, and I commented multiple times on how challenging it must have been. But not only was she the main character, Marling also wrote and co-produced the show, so she is a real girl boss! I'm unsure if she wrote the script alone, but if so, I'm impressed! There were some really beautiful passages, like "knowledge is a rumour til it lives in the body," and I thought that each voice that had been created for the characters suited them so perfectly. The story was so detailed and winding, that I feel like it must've taken her forever to pin down exactly what she wanted to say. She is seriously one of my new inspirations and I can't wait to see what kind of things she creates in the future. One thing that you may not like (or maybe you will) about The OA is that it will 100% leave you with more questions than answers. The ending left me feeling quite dissatisfied, as there was no closure, which makes way for another season but also gives us, as viewers, the chance to reflect and create theories of our own. Seriously, there are TONS of articles on the web with theories about this programme, so make sure to watch it first before you go snooping! But all the way through, not just at the end, we question pretty much everything - and after reading a bunch of theories, I'm questioning even more. For real though, what was the therapist doing in her house? Believe me when I say that I almost didn't make it past the first episode. I didn't feel fully invested and wasn't quite sure what was going on, but once I played the second, I was hooked. So if you feel like it isn't for you after watching the first episode, please please please just give the second episode a go. I promise you, things become a lot easier to follow after that! While the narrative is twisty and there are a lot of stories within stories, it isn't too hard to follow and doesn't require too much thought. With 8 episodes at around an hour long, this is something that can be watched in no time at all, so definitely give it a go! If anyone has already watched it, please tell me some of your theories because I'm dying to talk to more people that have seen it! I think it's going to become something of a cult show and I'm desperate to see if a second season will be made.